Lack of power, that was our dilemma. We had to find a power by which we could live, and it had to be a Power greater than ourselves. Obviously. But where and how were we to find this Power? Well, that’s exactly what this book is about. Its main object is to enable you to find a Power greater than yourself which will solve your problem. That means we have written a book which we believe to be spiritual as well as moral. Inc, A.A. World Services. Alcoholics Anonymous, 4th Edition (p. 45). A.A. World Services, Inc.. Kindle Edition. 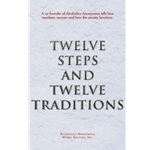 Alcoholics Anonymous World Service Inc.. Twelve Steps and Twelve Traditions (p. 132). AA World Services, Inc. Kindle Edition.